Members of a Melton church have enjoyed their first glimpse of a stunning new stained glass window set to be installed there. The window will go on the north side of the Nave in St Mary’s as part of the £1.9 million renovation project currently being undertaken. Church representatives paid a visit to the studio of stained glass artist Derek Hunt to check on its progress. The design reflects the heritage of Melton, with an ancient town crest dating back to 1549 to represent the work of the town estate and the church in the community. It also features a small picnic basket containing the borough’s trademark foods, Stilton cheese and a pork pie, and a fox, to mark the local hunting connections. These are all arranged around the central theme of a ‘tree of life’. The window has been commissioned in memory of former parishioner John Plumb, who left £1.3m in his will to the renovation scheme, known as the Re-ordering Project, when he died in 2014. An Honorary Life Member of the Melton Mowbray and District Historical Society and a notable local historian, he was born and raised in the town. 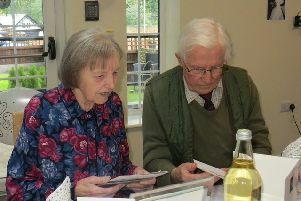 A former teacher and later assistant director of education at Nottinghamshire County Council, Mr Plumb became a leading light in the Melton Mowbray U3A and Melton Mowbray Heritage Forum.